Bexley is the type of London borough which can give you plenty in terms of attractions. But if you need something more specific, something more nature-related for a good time of rest and relaxation, then you are quite in luck. Bexley has some of the nicest open spaces which you can enjoy by yourself, with a friend, or try to enjoy them while trying not to get your kids lost in the vegetation. This is basically the must-see location in the Bexley borough. You must see the great Tudor mansion, you must see the beautifully-maintained gardens, you must see the exhibitions museum, and you must see the Queen’s Beasts dragon hedges they keep in the garden. Shockingly, they are not shapes of Pokémon. This is the borough’s largest park, with a size of 78 hectares, and here you can enjoy nature in its fullest. Parts of it, specifically the Danson Park Bog Garden, is a Local Nature Reserve, so don’t fool about there too much. This is also the location of the Danson Festival where you can enjoy stalls of arts, crafts, charities and other activities. No relation to Ted Danson. Enjoy a walk in this vast expanse of parkland and woodland. This contains part the infamous (in the city) London Loop, which runs through it under the alias of ‘M25 for walkers’. There are also a couple of really nice bridges that cross the lake to view or walk over. This is a real place for tranquillity, so do keep it down when passing, okay? On to the darker side of nature, in Bexley you can also find a little marshy area called Erith. It is a grazing marsh, so you can find some wildlife there, and, luckily, no alligators. This is a Site of metropolitan Importance for Nature Conversation, and if you think this is a mouthful, wait to smell the fresh moist air. Okay, enough with open spaces. Go to this centre to see some real variety of colourful butterflies posing on all sides. Don’t forget you camera, because these attention seekers want some photos done. 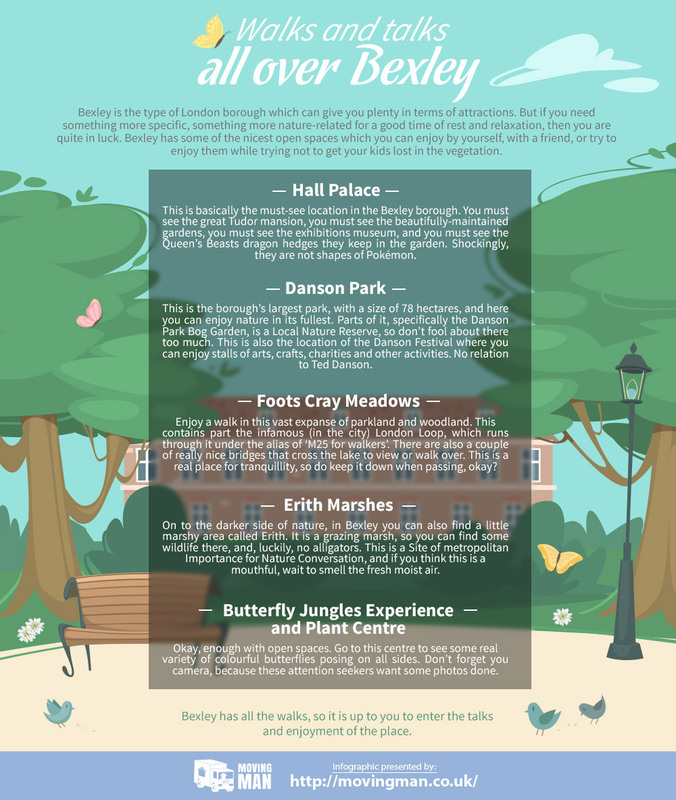 Bexley has all the walks, so it is up to you to enter the talks and enjoyment of the place.